IMG_0409, originally uploaded by Prince of Petworth. The following is a first hand account of the fire Wed. night at the Cooper Cafritz Mansion in the 3000 block of Chain Bridge Road NW, as witnessed by Michael Kuna a student at American University. Its almost 8:30pm and the smell of smoke is in the air. I walk north on the quad when turning back I see a plume of smoke coming from behind the tree line of the American University campus. Jumping into a car, I realize I’ve never heard this many sirens blaring at once, as a fire truck tears down Nebraska Avenue NW, adjacent to the campus. As I continue down Nebraska and peer to my right the smoke surges from above the trees. A cop shoots past us and blockades the entrance to Chain Bridge Rd. NW. Looking down the road there is a train of flashing white and red lights. We bear left; I am in the car with fellow AU student Chris Toth, onto University Terrace NW, this street runs behind Chain Bridge Rd. Two deer, a larger 4-point and a doe run along side the street as if to run from the blaze in a Bambi-esque fashion. To our dismay I slowly start to realize that this is the home of Peggy Cooper Cayfritz: DC activist and founder of the Duke Ellington School of the Arts. I see from the back of the property, that’s pours over onto University Terrace, one of DC’s largest homes up in flames. If the word firewall could capture any moment it would be this one. Residents from the neighborhood feverishly leave their doors, with confused looks, to see the fire. Fire trucks are still arriving on the scene and ambulances tear through the crowds with loud sirens. The crackle of the ember has shot chills through the bodies of everyone in sight. Onlookers can only fear for property surrounding the blaze as the trees of the estate bend and seem to carry an orange tint. The fire burns in the reflective windows of the houses across the street. Small embers rise with the wind like stars moving over the treetops under the half moon. We walk back up Nebraska Avenue to see blockades in the road and redirected traffic. 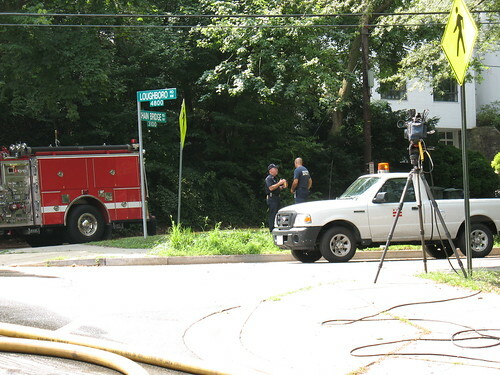 Fire trucks from Petworth and Glen Echo have now arrived as the firefighting units mobilize at the bottom of the street. With no questions or opposition we continue up Chain Bridge to walk past the long line of fire department vehicles, trucks and ambulances. Again residents, struck with fear and worrying for the Cayfritz home are talking and looking on into the fiery blaze. I hear a man from a neighboring home discuss the water pressure in the area. Still water oozes from the fire hoses and hydrants illuminated by the blaze and flashing lights, by the time hoses were in place and hoses pressurized, the house had been engulfed. Smoke has filled the street and works its way into the surrounding area. An unknown lady is lying on a stretcher out into the street. From a distance she seems responsive to her tending paramedic but her identity will remain unknown to me as a policeman tells me to back up or the pressurized hose between my feet might carry me as high as the flames. As the neighbors move out, cameras start to roll in. It seems they’ve missed a good portion of the fire. Its close to 9:30 now, I hear voices as we walk back to Nebraska Avenue, something about a friend having dinner at the house tonight or nearby. Rolling back into Tenleytown one could still smell the smoke more than 2 miles from the blaze, my neighbors in the area already had firemen at her house on complaint of smoke in the air. It seems the weight of the situation is felt miles away from the blaze.